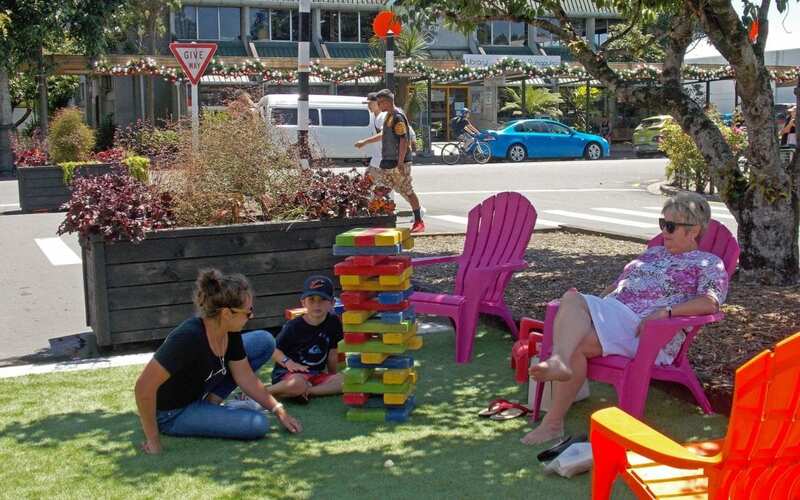 Masterton District Council is embarking on a rejuvenation of our town centre. We need to make sure it attracts people – both Masterton residents and visitors – and delivers what they want. Our latest initiative as part of this project, Play on Park, is now open for the community to enjoy. The space, along one side of Park Street, includes giant games, a market area, basketball hoops and skateable furniture. This is a temporary installation as part of the testing process for our town centre revamp. Throughout the testing phase we will be experimenting with these temporary “placemaking” initiatives called parklets. They are small seating areas or green spaces alongside a pavement, often in former parking spaces. These are a great way for us to explore possibilities and what people in our community are keen to see more of, but they’re only the beginning of our whole rejuvenation project. More natural landscapes and plantings throughout the town centre. Park Street will also be playing host to Summer Night Markets that will run for 4 Fridays – 18 Jan and 25 Jan. If you’re interested in being a stallholder we have limited spots so please get in touch with us now! We want to hear what our residents think about these initiatives, you can find out more about the projects and have your say on our dedicated revamp site. Be sure to check out some of the Frequently Asked Questions as well, which detail all of the exciting projects to come.